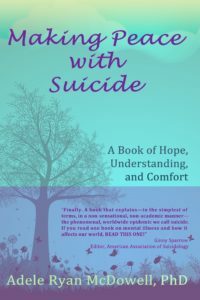 Book Review: Making Peace with Suicide by Adele Ryan McDowell, Ph.D.
Insightful, compelling, and compassionate, Making Peace with Suicide: A Book of Hope, Understanding, and Comfort takes a good hard look at the world-wide phenomena of suicide. 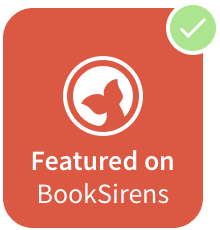 This book is designed for anyone who has lost a loved one to suicide and felt that sucker punch of grief; for anyone who is in pain, walking unsteadily, and considering suicide as an option; and for anyone who works with, guides, or counsels those feeling suicidal and/or suffering the profound grief from a suicidal loss. Making Peace with Suicide includes stories of courage, vulnerability, and steadfastness from both the survivors of suicidal loss as well as the unique perspective of the formerly suicidal. It offers shared wisdom and coping strategies from those who have walked before you. 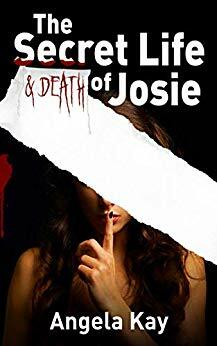 It explores the factors leading to suicide and the reasons why some do and some don’t leave suicide notes. Making Peace with Suicide sheds light on the phenomena of suicide vis-à-vis our teens, the military, new mothers, as an end-of-life choice, and asks if addiction is a form of slow suicide. It provides a seven-step healing process and opens the door to consider suicide and the soul, the heart lesson of suicide, and the energies of suicide. If suicidality has impacted your life, Making Peace with Suicide is a must-read. You will be guided through the unknown territory, given insights to allow understanding, stories to help you heal, and ways to make peace with a heart wide-open. Making Peace with Suicide is good medicine for the body, mind, and soul. When I was a young girl, my much older cousin killed himself. My mother was the one to tell me. She agreed that it was quite sad and said that it happens sometimes. She told me that is a really selfish act but some people just couldn’t survive, for whatever reason. I don’t think most have many answers or insight, so how do you explain suicide to a young child? I think that if my mother had this book, ‘Making Peace With Suicide,’ she may have been able to better explain it to me and perhaps been better equipped to help my aunt and uncle. The author, Adele Ryan McDowell, Ph.D., brings her experience, insight, and compassion to assist people in coping with suicide and attempts at suicide. The book is well written and easy to understand so it is really for anyone. I also think it should be required reading for those entering a profession that counsels people on suicide, be it a psychologist, doctor, or clergy, etc. All these years later, the death of my cousin is still with me. I find a lot of comfort in what Ms. McDowell shares in her book and will turn to it again if the occasion should arise. I hope not but you never know what life will bring you and when. 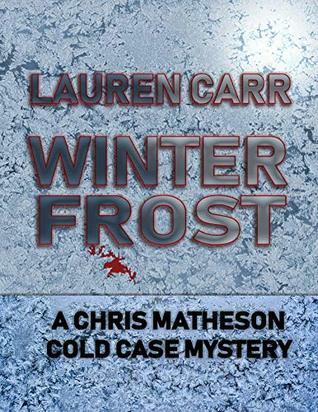 I highly recommend this book and give it five stars! The book was sent to me for my honest opinion. Suicide is not a sin, from my point of view. Some religions espouse hellfire and damnation; others ponder the intention of the suicidal individual. Since I see all of us on a path to open our hearts, expand our consciousness, and operate from our Best or Higher Selves, I do not believe that the Divine—in any form or moniker— is looking to punish us for being human. The Divine is all about love—unconditional love—and helping each of us find the pathway to that conclusion. Individuals who take their life by suicide are not punished. (Quite frankly, haven’t they lived through enough hell?) That is old school thinking to me. If you believe in heaven, they are in heaven. If you believe in past lives, their souls are being readied for their next assignment. Where we all can agree is that the soul has moved out of the constraints and limitations of the 3D world and moved to another nonphysical dimension. Suicide is not a crime. (For the record, suicide is no longer illegal in the Western world, where suicide has been decriminalized. There are, however, legal ramifications to assisted suicide and the like). Some say the weak choose suicide. I disagree. “Weak” is not the operative word here. Suicide can be a choice that we may or may not understand on the 3D level, such as a teaching tool for our loved ones or choosing to do profound work from the Other Side. Suicide can be a part of our destiny, our soul path toward healing. Suicide can be the result of soul loss. Suicide can be a game-changer. After the loss of a loved one to suicide, your view on life changes. Life becomes more fragile, more precious, and more cherished. This holds true for those who have attempted suicide as well. For them, the attempt may lead to a spurt of fresh energy and a re-engagement with life. And suicide is definitely a societal, and, therefore, a political and moral issue. We human beings—and our organizations, corporations, or governments—can be terribly self-serving, ruthless, abusive, and tyrannical toward others. Acts of violence, war, and exploitation damage and destroy the very souls of our being. We lose ourselves and the meaning of our lives. Suicidal thoughts and actions are a part of the collateral damage of these polarizations. Further, suicide can be a powerful teacher. It teaches us the great lesson of compassion. It opens us in ways we never thought possible. Suicide asks us to accept a loved one’s choice and circumstance. Suicide asks us to forgive ourselves for our perceived wrongdoings, including our inability to prevent our loved one from harm. Suicide requires us to face our guilt, anger, and shame. Suicide asks us to accept the unacceptable, the inconceivable, the horrific, and make peace with it. Suicide asks us to live with an open heart. This means no judgment, no castigation, and no punishment. We see one another through a lens of acceptance. We allow each other to be who we are—in all of our shortcomings and crazy-making ways as well as all of our idiosyncratic wonderfulness. Praise for Making Peace with Suicide by Adele Ryan McDowell, Ph.D. 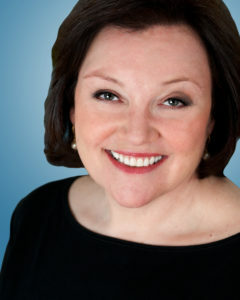 Described by one of her smaller clients as “The Feelings Doctor,” Award winning author, Adele Ryan McDowell, Ph.D., is a psychotherapist with 35+ years’ experience who likes looking at life through the big view-finder. Dr. McDowell has worked with suicide, domestic violence, and sexual assault crisis hotlines; survivors of Hurricane Katrina, 9/11, the Joplin Tornado, and the Newtown shooting; and clients struggling with addiction as well as those moving through profound life changes such as loss and health challenges. Her work focuses on helping clients find hope, balance, and peace in the face of crisis, trauma, abuse, and grief. Adele — a Texan by birth and pioneering spirit — lives in Connecticut where you will often find her driving along the highways and byways, singing loudly in her car. 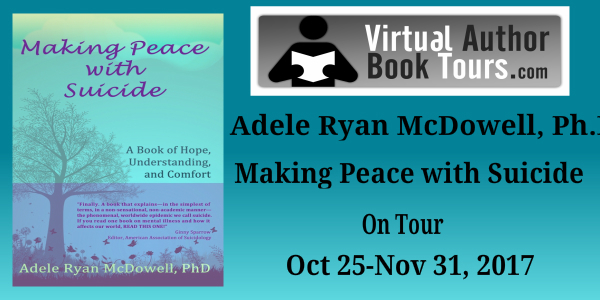 Buy Making Peace with Suicide by Adele Ryan McDowell, Ph.D.